A while back I shared this post at Wild about Teaching. Since I’ve gotten so many new followers, I thought I’d share it with you all again. Fluency is an often overlooked aspect of reading instruction. I know that I was guilty of it for a long time. I would try to throw in a Readers Theater on weeks that were “off” and we couldn’t do our normal routines. I would talk to the kids about “reading like they were talking” but didn’t focus a lot on it. A few years ago I went to the National Conference for Literacy Learning put on by SDE. I heard Tim Rasinski speak. Everything he said just made so much sense. I bought a couple resources from him and the ideas started flowing. Because I did reading instruction with a large group of students who were below grade level, I needed to try some different ideas and the ideas I got from this workshop were great. One big idea I introduced was using the Fry sight word phrases. Previously, I had used sight words, but hadn’t done much instruction with the phrasing. I took each list and broke it down into 4 chunks. I then created a Powerpoint for each chunk. When students finished with their work early, they went over the computer, and read through the PPT with the phrases. They would whisper them to themselves. When students felt they could read the phrases with fluency, they called me over to listen. If they read them well, they moved to the next list. I made it a challenge for my students by offering small rewards when they made new achievements. For example, the first student to make it all the way through would get a new book of their choice from me. Because these were struggling students, I was happy to use a book as the dangling carrot for their hard work. Another method I used, with my younger students, were games with the Fry phrases. I created a baseball game that I used in my small groups. I’ve updated the game and posted it in my TpT store. 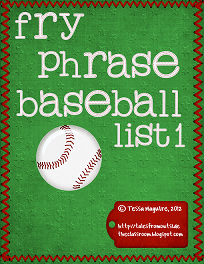 You can get the game for List 1 of the Fry Phrases for FREE. Just click the pictures below. I have the same game for the rest of the lists as well. You can get them by clicking here. I hope I’ve been able to give you a few ideas on how you can use the Fry Sight Word Phrases in your fluency instruction! Also, I reached 1,000 Facebook followers overnight! I will be offering some giveaways on my Facebook page this weekend. If you aren’t following me yet, head on over and join the club so you don’t miss your opportunity! It’s http://www.facebook.com/TalesfromOutsidetheClassroom. I have heard Tim Razinski speak twice, I learned so much from him and he is a great resource! Thanks for the freebie! I just found your blog from a Linky Party. It's cute!